‌Flame Nevy Blue Designer Suit in Tappeta silk. Yoke is embellished in havy embroidery work. Available in Two colors(Nevy Blue & RED ) . 95% of our customers believe that the product is as shown on the website. 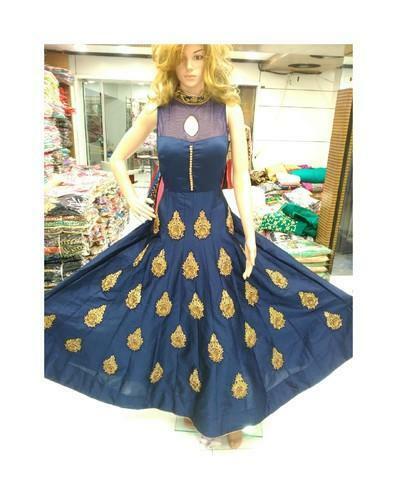 Integrated in the year 2004, in Surat (Gujarat, India), we “Vikas Fashions” are the reckoned organization actively engaged in manufacturing and supplying an excellent range of , Party Wear GOWNS Suits, Casual Suits, Fancy DressMaterial(semistiched) Readymade GOWNS and many more. Our creative designers design the offered suits with utmost care using best quality fabrics and advanced machinery as per the current market trends. These suits are highly demanded in the fashion industry owing to their fine stitching, comfort fitting, shrink-resistance, unique design, skin friendly, attractive color combination and durable print. Our provided suits are strictly checked against several parameters by our quality auditors. In order to meet the clients various needs, we offer the suits in numerous colors, prints, designs and patterns. We are offering these suits under the brand name Gori Suits.